This gay group trip will introduce you to Turkey’s rich cultural history. From Istanbul to the Caves of Cappadocia and the ruins of Ephesus, you’ll see many of the world’s greatest historical sights. What is now Turkey used to be the heart of the Byzantine Empire, founded by the man who spread Christianity throughout the world, Emperor Constantine. When you’ve settled into the hotel we’ll explore the local area and have a welcome dinner. Over the next two days we’ll explore the city, including Hagia Sophia – it was built in the Ottoman era in 537 AD. 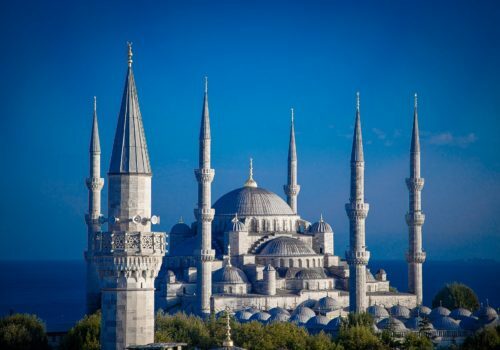 We’ll also visit the Sultan Ahmet Mosque, visit traditional Turkish Baths (hammams), peruse the Grand Bazaar and explore the bustling streets. Naturally, we’ll take a boat ride over the Bosphorus and see the iconic sites that would have greeted the crusaders and invading Turks. Today we’ll take a short flight to Izmir and visit the well-preserved Roman city of Ephesus. Here you’ll get a glimpse of antiquity. After a guided tour we’ll have lunch and head to the resort city of Bodrum. We’ll stay here for the next two nights. Today we’ll enjoy a leisurely ride on a gulet, a wooden sailing vessel. We’ll eat onboard and then return to Bodrum. The following day we’ll drive to Fethiye and have lunch by the harbour. Then, we’ll drive along the Lycian Coast. We’ll sail to Kekova and then explore the ancient site of Maya, the port city of Antalya. Here we’ll stay for two nights and enjoy a night tour of the city. Today we’ll visit Perge, an ancient city founded during the Trojan War. Alexander the Great passed through here, as did the Apostle Paul. We’ll then head to the Pamphylian city of Aspendos which is full of Roman and Byzantine ruins. This morning we’ll head to Taurus Mountains and visit Konya, home of the Whirling Dervishes. We’ll have a tour of the city and check out the museum and learn about this famous mystic sect. We’ll be driving along the Anatolian plain to Cappadocia where we’ll visit the Caves of Cappadocia. Malleable volcanic rock has been refashioned into incredible shapes by years of rainfall – this is one of the most striking landscapes on the planet. Descending into the earth we’ll visit the underground city of Derinkuyu. Then, we’ll head for lunch and a watch Whirling Dervish ceremony. We’ll also visit the open-air museum of Göreme and, if you’re up for an early start, a hot air balloon ride. Today we’ll return to Istanbul and you’ll be transferred to the airport for your return flight.